You know that saying? “If you ever want to test your relationship, try hanging wallpaper together”? That is no exaggeration. At all. But sometimes, that wallpaper has to be hung. Sometimes those cabinets need to be painted. And sometimes in the excitement of making a home together, an argument can ensue with one little DIY gone wrong. We’ve had our moments when projects didn’t go according to plan. When we had to grit our teeth and bite our tongues. When we just had to walk away from the home improvement scene for the sake of maintaining our sanity. It’s normal. DIY projects can be tough to begin with. But when you throw your relationship into the mix, things can get heated. I can confidently tell y’all that Robert and I do make a rockin’ DIY team now (he’s my better half for sure), but it took a lot of learning. If one of us gets an idea for a project, we show each other photos we find for inspiration so that we have the same vision. It’s all about the communication. I usually figure out the cost with a materials list, and Robert often handles the technical end of things with measurements. I try to draw up a diagram to help visualize our project too. Our DIY wood beam doorway took weeks of discussing beforehand to make sure we both understood what our steps of the project would be. A lot of times, if we get aggitated during a home improvement project, it’s because we’re feeling rushed. 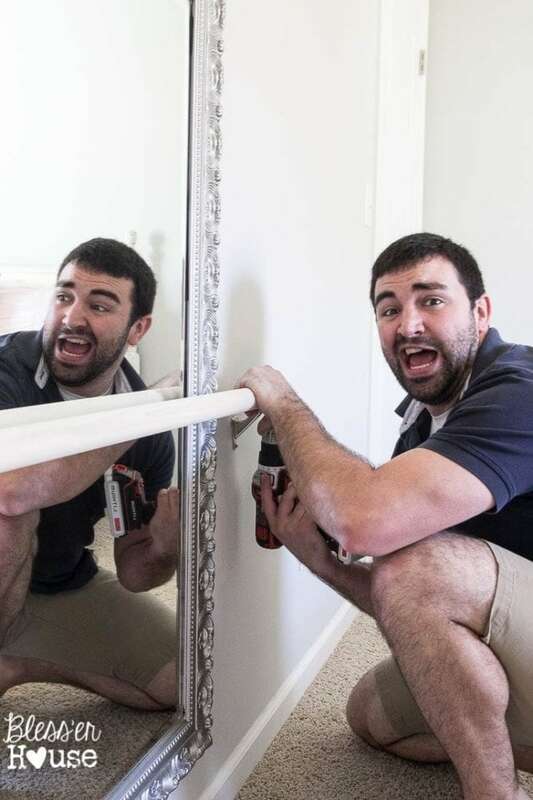 Go into it knowing a DIY will probably take longer than you plan. Don’t try to squeeze in a big project on a Sunday after church and before an evening outing. Be ready for that time commitment. 3. Go into it knowing there will be mistakes. Do all things with grace. Including DIYs. 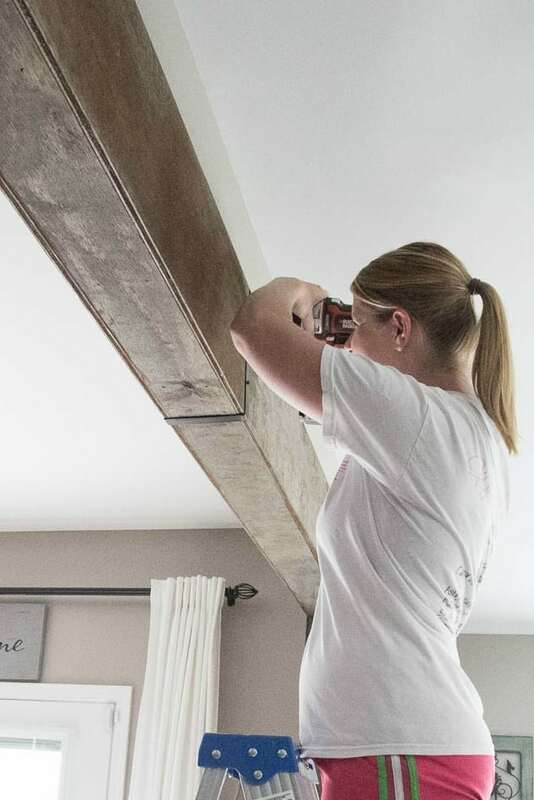 If a piece of wood ends up cut too short, a piece of wallpaper rips mid-hang, or paint is splattered on the carpet, shrug it off and persevere. I remember the morning of our wedding day, I woke up and said to myself, “Something will go wrong today, but that’s okay. In the end, as long as I get to marry my best friend, that’s all that matters.” And you know what? Some things went wrong, as they often do at weddings. But I had peace in keeping what’s most important in perspective. The same frame of mind goes for DIYs and in every day of marriage. Something will go wrong, but it’s okay. 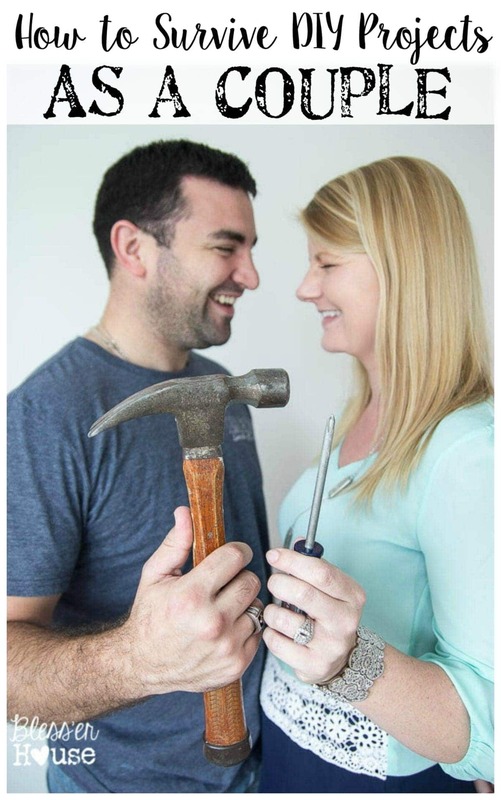 Keeping your relationship strong matters way more than getting into a fight for accidentally ripping a hole in your drywall. When Robert does something well, I let him know. When I design something that looks good, Robert tells me so. That positivity will carry you through together. 5. Get excited about it together. In the middle of a home improvement project, we like to take a step back and appreciate how things are taking shape. Celebrate with a little victorious booty shake and a fresh energy to keep working. People don’t respond well to barked orders…or at least I don’t. Robert and I try to say, “Will you hand me that screw driver?” or “Go grab the tape measure for me please.” A “thank you” never hurts either. It just communicates that mutual respect for each other and creates a positive atmosphere. When we’re wrestling with some complicated aspect of a DIY, kind words help. 7. Breathe and hold your tongue. When a DIY doesn’t go according to plan, we talk about solutions to fix it. And yeah, we get mad when things don’t run smoothly. But we try not to pout about it; we find a plan B together instead. 9. Know when it’s time to take a break. If tempers rise, walk away from your project for a while. Most of the time for us, we start to bicker because we’re tired or hungry. Go grab a bite to eat, take a rest, or go walk around in the fresh air. 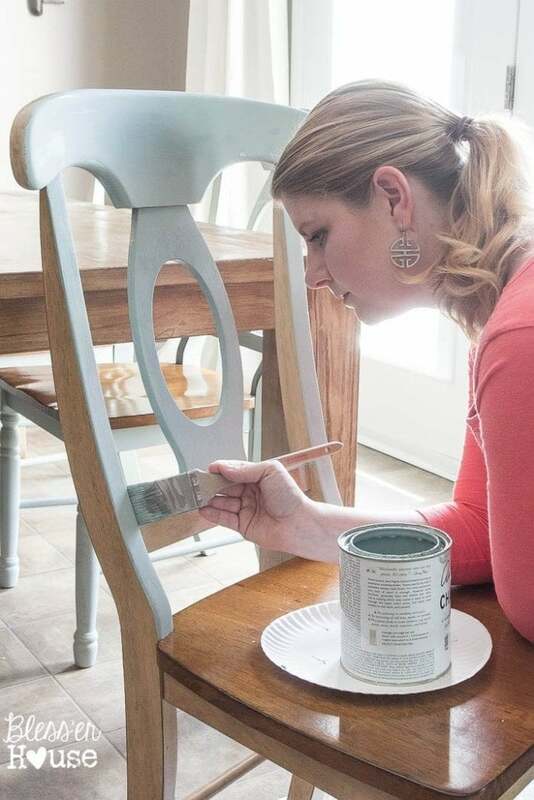 Then tackle that DIY again refreshed and ready with a better attitude. (Bonus) 11. Be proud together of what you accomplish. When our DIY adventure is over and we step back to survey our finished “masterpiece”, we breathe a sigh of relief and get excited all over again for what we accomplished together. The more projects we do, the more camaraderie it builds. Thank each other for the hard work you did. 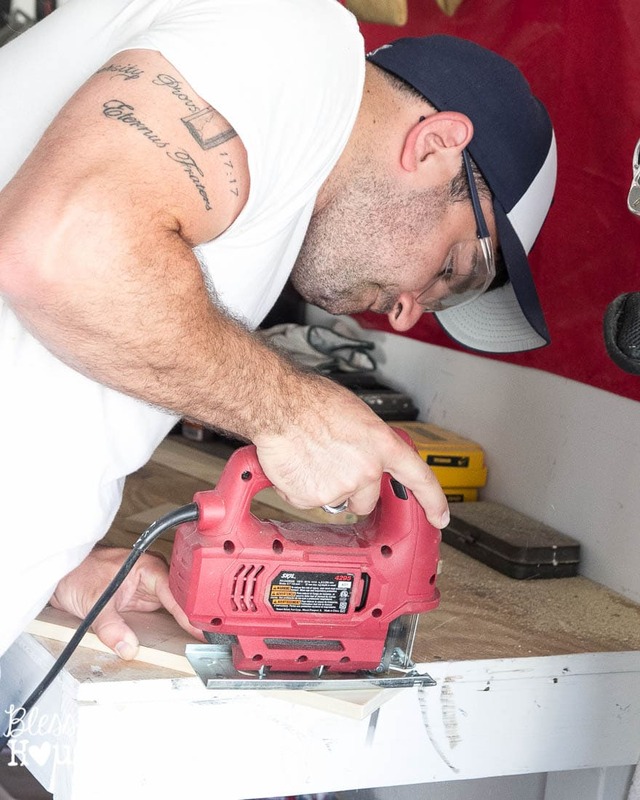 Continue on your DIY path with the knowledge that you are a team and you’re in it together. When you consciously make an effort to stick to the right attitude, you’ll end up with so much more than a beautiful finished project. You’ll have a stronger marriage. Happy DIYing, y’all! If you want to see the projects we’ve braved together, you can find all of them in the project gallery here. You can find out more about us here too. Beware, we’re total weirdos. Normal is overrated. Very, very wise words, Lauren! my husband and I call ourselves “team awesome”. We have learned over the years how to work best with each other. It took some trial and error, but in the end we are so proud of all our work. That’s awesome! (Har har) Seriously though that’s so great and definitely something to be proud of. You two are so adorable together. Pretty soon you’ll have your own tv show on HGTV! Great posting. Everything you wrote applies to making a happy marriage. That is the point of life. Thanks, Nancy! Totally agree! A lot of these certainly apply to every aspect of marriage, DIY or not. Haha I totally get you on the glazed over look. I do that too. And sometimes I hit the ground running on some “brilliant” idea I have and leave my poor hubby in the dust totally lost. I have to slow down and explain because I get carried away on projects. Communication is everything. I’m sure you’ve figured that one out too.